Eye candy time. Here are some pictures of really well-done Early Imperial Romans. I like to have pictures like these to use as a painting guide. Among his other talents, Julius Caesar also was a very good writer. The “Commentaries” on the Gallic and Civil Wars are classics of military literature, providing a unique insight into Caesar’s military campaigns. While it is true that there is an element of propaganda here, remember that history always is written by the victors. You can get the Commentaries in a free etext version here. Teacher’s Comments: A “social history” of the men who fought for the Roman Empire. 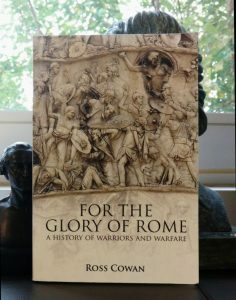 For The Glory of Rome: A History of Warriors and Warfare is an unusual military title in that it is more social history than an account of military campaigns. In For The Glory, Ross Cowan focuses on the motivations, emotions, beliefs, and superstitions of soldiers in the Roman Army (and of some of their notable enemies). While some attention necessarily is paid to renowned leaders such as Caesar and Antony (and, as an opponent, Phyrrhus), the vast majority of the book focuses on the experiences of less significant (though still individually identified in the historical record) figures. Among these are Marcus Sergius Silus, who fought with a prosthetic iron hand; Lucius Siccius Dentatus, who in his 40 year career suffered 45 wounds — all to his front; and the Centurions Lucius Vorenus and Titus Pullo, who were featured in the HBO series Rome. Romans and Gauls is a set of simple free wargames rules. Eagle Rampant is a Roman Ancients variant for Osprey Games’ Lion Rampant rules for small scale medieval wargaming. And an after-action playtest report.